The P3ProSwingTM is a leading instruction tool, giving highly accurate data of your club before, at and after impact with the ball. Used with any club in your bag, the P3ProSwingTM is a complete swing analysis system for golfers of all levels. Best of all, the P3ProSwing evolves into an advanced Golf Simulator, including multiple course play with the P3ProSwing Virtual Course Packs. P3ProSwingTM analyzer consists of a 9" x 14" high tech sensing platform and software program that measures and captures the information from 65 optical elements to create an instant visual representation of your swing data. The P3ProSwing provides a full range of information to help you understand the mechanics of your club through your swing and the resulting ball flight calculations. You will receive dynamic swing analysis that will give you an accurate, objective, and scientific analysis of each swing that you take whether on the driving range or the back nine. We sell P3proswing, Optishot, Personal Pro, Trugolf and Protee. 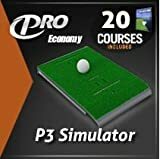 P3proswing is the best golf simulator system to work on your swing and improve your game. Used by PGA Professionals and teaching pros. We sell complete golf simulator systems including cages, nets, screens, mats and electronics. All can be customized. Can use real Balls! 92 courses available. We sell P3proswing, Optishot, Trugolf and Protee. 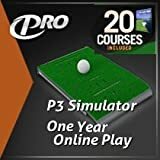 P3proswing is the best golf simulator system to work on your swing and improve your game. Used by PGA Professionals and teaching pros. We sell complete golf simulator systems including cages, nets, screens, mats and electronics. All can be customized.